Hundreds of standardized test questions and answers were published on social media websites, apparently in photos taken by students on cellphones that were supposed to be put away. 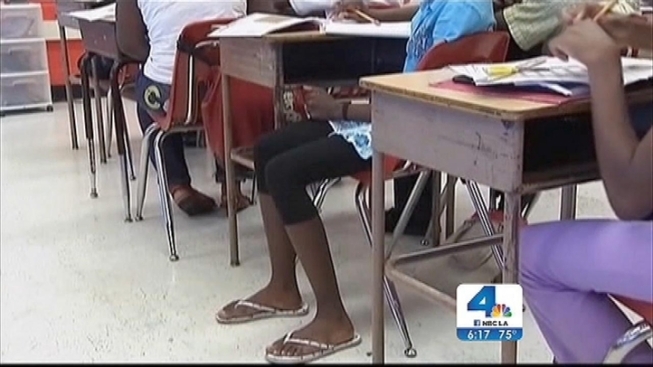 Students in Los Angeles said the tests they took in the spring were accompanied by a strict set of rules. "They made us put our cell phones in a little bucket so we wouldn't take them out, and they told us if we were cheating we would pretty much be expelled," said Anjani Mistori, a ninth grader. In Mistori’s class, taking out a cellphone was impossible. But somehow, in April, students from nearly 250 high schools across the state posted pictures online of Standardized Testing and Reporting Exams (STAR) questions and answers. The most serious offenses were the postings that were actually legible. They came from 16 schools, including several in Los Angeles and Monterey Continuation High School in Burbank. "It does not surprise me because now, with current technology, we can instantly communicate all kinds of pictures, messages from other people. It does not surprise me," said Dr. Jan Britz, superintendent of the Burbank Unified School District. The state requires all test administrators, usually teachers, make sure all electronic devices are removed from students' desks. But it's not required to make sure those devices are out of reach, for example, left outside the classroom. "We just have to be as vigilant as we can, keep an eye on all the kids and adhere to test security -- but it's becoming more and more difficult," Britz said. Last year, 12 schools were investigated after students posted images of test questions online. The consequences of doing such could be serious. School that were flagged could face their Academic Performance Index (API) scores being revoked, which could harm their rankings and, in turn, their resources and funding. The state department of education has requested that all the posting be removed and so far, NBC4 has not found the ones specifically flagged by the state. As far as the consequences, the schools will find out what will happen with their API scores in a few weeks.